Hey! Have you heard? 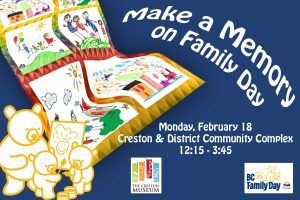 The Creston Community Complex is planning a bunch of free stuff for Family Day: free skate, free snowshoe lessons, free swim. 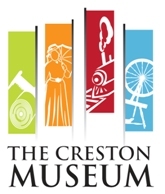 And the Creston Museum will be there with a very special project! We’ll give you a piece of fabric and all the colours of markers you could wish for. Draw a picture of your favourite family memory on the fabric – and then we’ll put all the memories together into a very special quilt! Leave us your email address or phone number, and we’ll make sure you get your very own invitation to see the finished quilt on display at the Creston Museum. Everyone welcome. Free for all ages. All materials supplied (and special thanks to Quilts for Kids, who meet twice a month at the Creston Museum and will be assembling the final quilt).